If you were an officer and upwardly mobile in the many such ranks as Lieutenant, Captain, Major and Colonel come to mind.�In the RAF, Squadron Leader, Pilot Officer, Wing Commander and in the Navy, Commander, Captain and Admiral or maybe a Submariner. You would, if you can identify your service in any of these areas, be entitled to one of our medals.�All of our international medals are available in some way to many of the professions I have mentioned.�So let�s look at some of the names that you will know from your service, bring up a picture in your mind of a destroyer, a submarine or submariner, the Parachute Regiment, the Royal Marines, the Royal Artillery, the Army, the Police Force, the Fire Brigade, military medals, bravery, valour, police Chief, the SAS, the RMFVR, Royal Marines Association, the SBS, the Royal Engineers, the Royal Corps of Transport, the Royal Artillery. On retirement you may have entered the Police Force as a policeman or the Fire Brigade as a fireman or firefighter or carried on to be a doctor, a medic or nurse and with these careers in the Emergency Services or the armed services you would be entitled to our International Emergency Services medals.�You may have risen to be a Fire or Police Chief or General Hospital Manager.�You would of course become a veteran. For those that entered the Prison service in later life we have a medal. Also in our stable of medals is a combined operations medal, nearly all who served in the armed forces at sometime were involved in this field of service. And finally we all become veterans when we retire from these services, so welcome to Fisher Patton and our wonderful world of medals the International Firefighters Medal, the International Ambulance and Medics Medal, the International Police Medal and the International Emergency Services Medal that all these civilian services (Police, Fire and Ambulance) qualify for. And of course our combined operations medal, commando service medal, veterans star, International Commando Medal and International Prison Service Medal. We have a full medal mounting service. Welcome to Fisher Patton and the Red Baron and our wonderful home of the most exciting medals in the international community. January 1962 found Alan at ITCRM (Infantry Training Centre Royal Marines) for Infantry (Weapons) Training and the Commando Course.�Alan at 17 years and 3 months was a fully trained Commando. At 18 � years, after 15 months in �43� Alan was drafted to 40 Commando Royal Marines who were stationed in Burma Camp, Malaya.�Four nights later he was with Charlie company (9 troop) in Borneo on active service.��40� was an active service commando and Alan found himself spending 3 months in Burma camp and 3 months in Borneo on active service.�He also took part in an exercise in the Philippines.�He also completed a Junior Command course and returned to the UK on promotion to Corporal (substantive) just after his 20th birthday. Before returning he saw a brief period of active service in Malaya and consequently now has medals for �Borneo� and �Malay Peninsula� and a �Pingat Jasa Malaysia� from the Malaysian Government.�Four years of service at CTCRM followed as a Corporal Platoon Weapons Instructor in Commando School.�Alan is proud of his Commando Instructor days training 32 squads on the world�s most rigorous military training course (the Commando Course lasting 6 weeks).�He also, as a Senior Corporal, instructed on a Young Officer batch taking future officers (and Brigadiers) through their Commando Course. 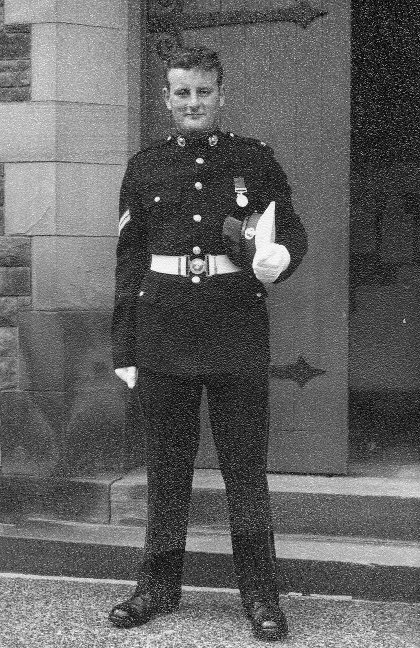 After four years Alan was drafted to 42 Commando Royal Marines in Singapore.�He was promoted to Sergeant and served with the unit in Singapore, Malaya, Hong Kong, Cyprus, Malta, Greece, Corsica and the Mediterranean theatre, returning to CTCRM in 1971. The return from Singapore and the pullout of British Forces from that area combined with a severe knee injury made Alan reflect on his achievements and call time on his military career. Alan now has retired from Fisher Patton and the Red Baron with his wife Sue. �They still live in North Wales with their son Evan, 3 dogs and 4 cats. Mark served with the Royal Marines for 4 1/2 years 1980 - 1984 After his extended time in training following his stress fractures in his feet with some time spent in Chosen and Hunter troop he passed out with 149 tp. He then joined 42 Cdo and after a short time in L Coy he joined M Coy. He made great friends who to this day are still in contact. He trained in Artic and mountain warfare and loved spending his winters in Norway, especially been hit several times on the head by his LMG. He served in the Falklands and will always remember that at times of need that the British Armed Forces will always perform above any expectations and will under duress perform to their best abilities.